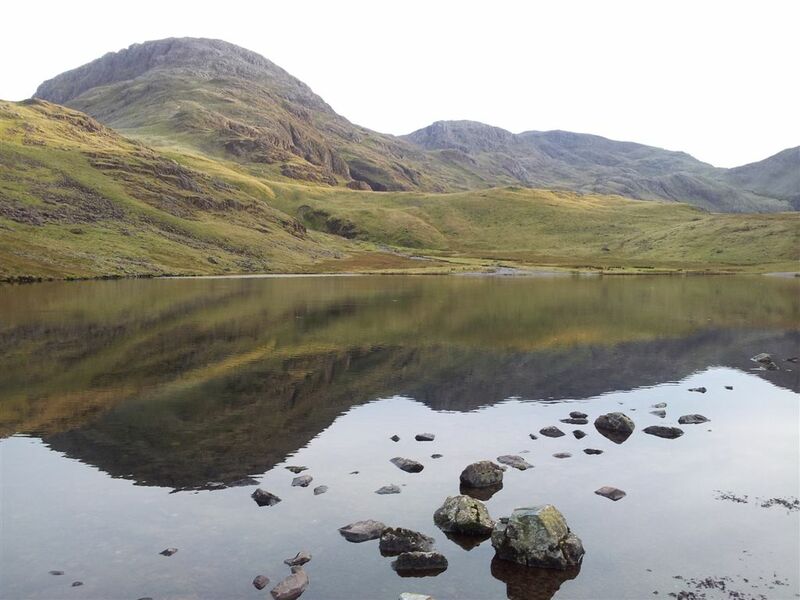 Thirty years ago after driving to Wasdale Head I clambered up a hill called Great Gable, it was my first ever mountain. 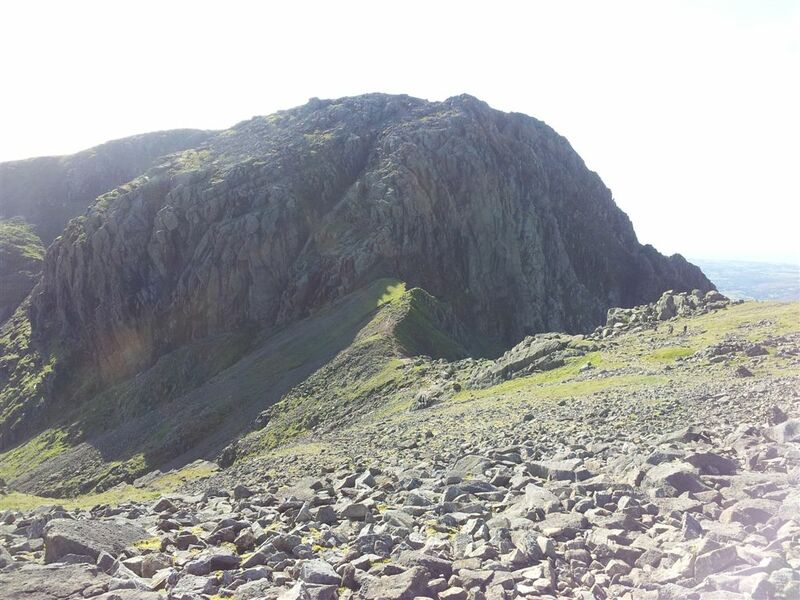 Later it was Yewbarrow then Pillar & Steeple, all done from Wasdale. 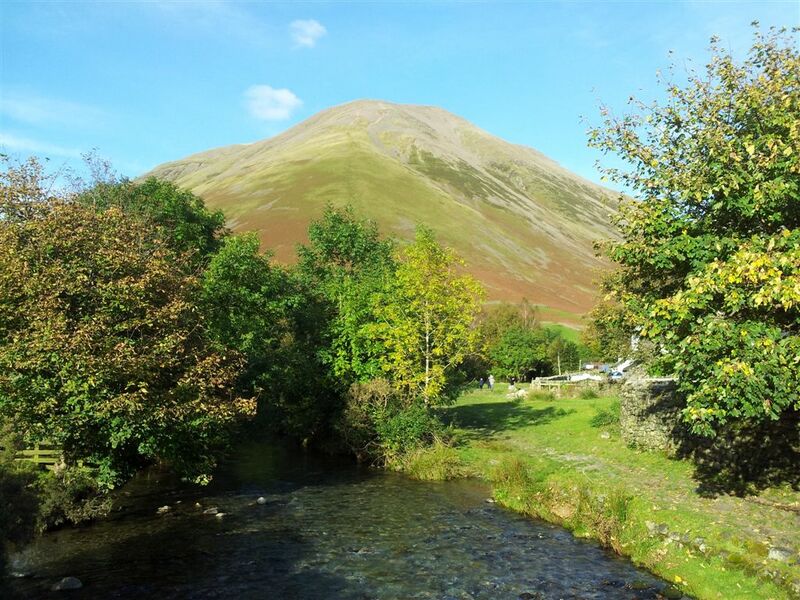 Eventually I discovered there were other valleys in the Lake District yet Wasdale will always be my favourite. Recently after walking from Seathwaite, me & my mate Alan were on top of Lingmell before continuing on up to Scafell Pike, Great End & Seathwaite Fell. Lingering on Lingmell we gazed down at Wasdale Head (as you do) reminiscing about the good old days and realising it had been 12 years since we last stood down there. 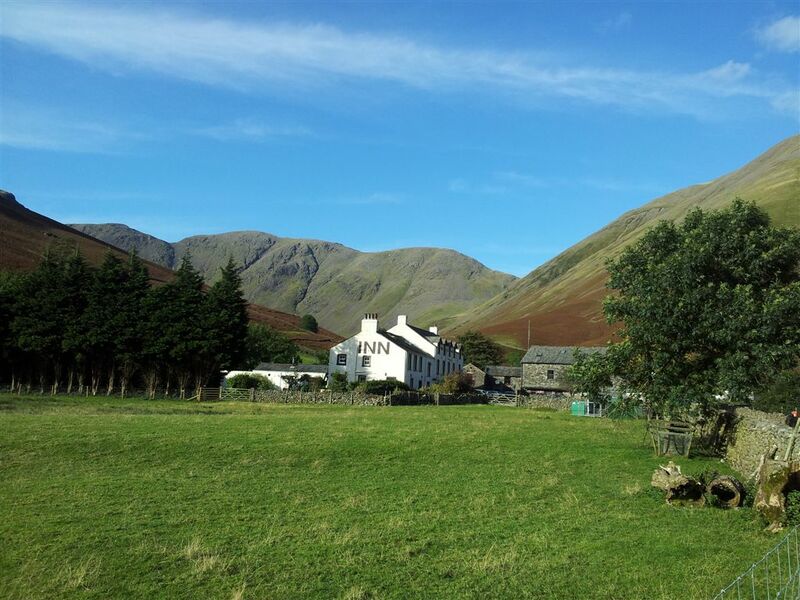 One of us came up with a route idea for a circular walk from Seathwaite up to Scafell Pike including a pint at the Wasdale Head Inn for posterity. This Sunday the weather was perfect for such a walk so we set off from Hexham parked up near the farm and set off. 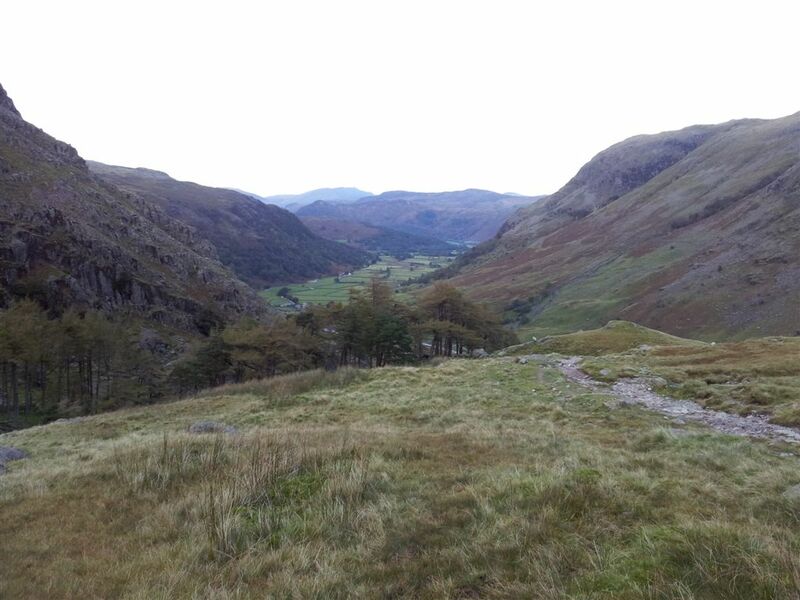 We’d chosen the Grains Gill route from Seathwaite up to Esk Hause to make a proper circular walk. My first time up that one and very impressed with the path & the gradient. We made good progress and as we gained height and the views opened up we realised this was going to be one of those great hillwalking days. For once the light was clear with distant views, hardly a cloud in sight, no rain, not too hot, not too cold, not too windy, no midges…..but tons of people. Well you cant have everything. Having left the car at 10am we reached the summit nearly 3hrs later after slowing due to the distracting views. I’ve been up there in all sorts of weather so this was a time to linger. I’ve also been up there twice alone, but unsurprisingly not today. Things were a little chaotic at times but hey at least all these people were outside enjoying the great outdoors. Oddly these 3 kids & 3 adults were later seen heading up Lords Rake. No fear there then. We had forgotten how extensive the views can be up here with the Isle of Man & the Galloway hills the clearest I’d ever seen. Blackpool Tower and Northumberland’s Cheviot & Hedgehope (83 miles away) were all confirmed with binocs. Here’s another panorama view, have I mentioned the word ‘view’ much yet? 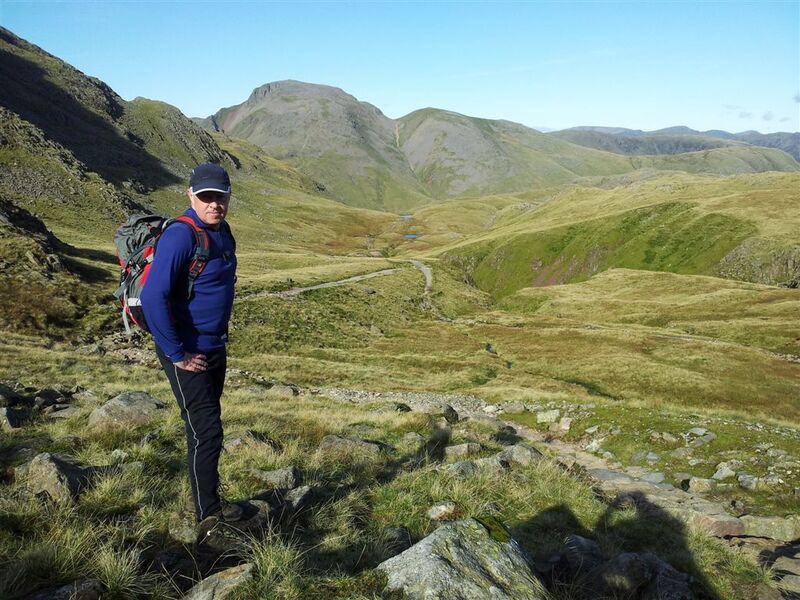 After 50 minutes on top it was time to reluctantly get moving and also time to reverse my first ever Scafell Pike ascent from Wasdale up to Mickledore. 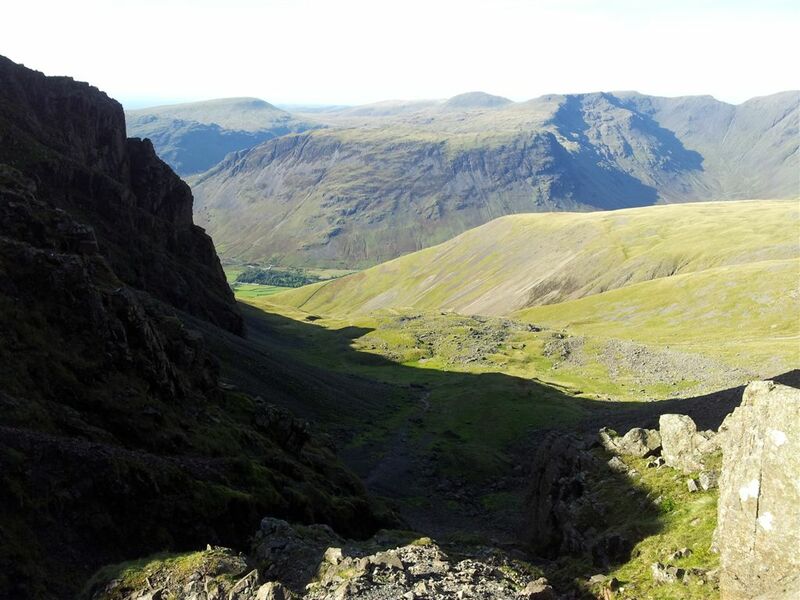 Everything had been going extremely well it was 2.20pm and the plan was to get down to Wasdale for 3.30pm, 45 mins in the pub, 2hrs back to Seathwaite, plus a spare 30mins, therefore reaching the car by 6.45pm, with sunset at 6.30pm. Hold on, what was that descent time again! Ok we’d underestimated that one and after picking our way through the eroded crumbly top of Mickledore that car park down there wasn’t getting any closer. We really had to pick up the pace descending then eventually found a sign pointing to ‘Wasdale Head’ taking us around the foot of Lingmell. I actually thought Alan was taking the piss when he read the sign out. Didnt know this path, but it saved some time AND kept height giving more of those ‘views’. Wasdale Head now ahead and there’s a pint with my name on down there. This isn’t posed by the way, this is just how I walk when I smell beer. 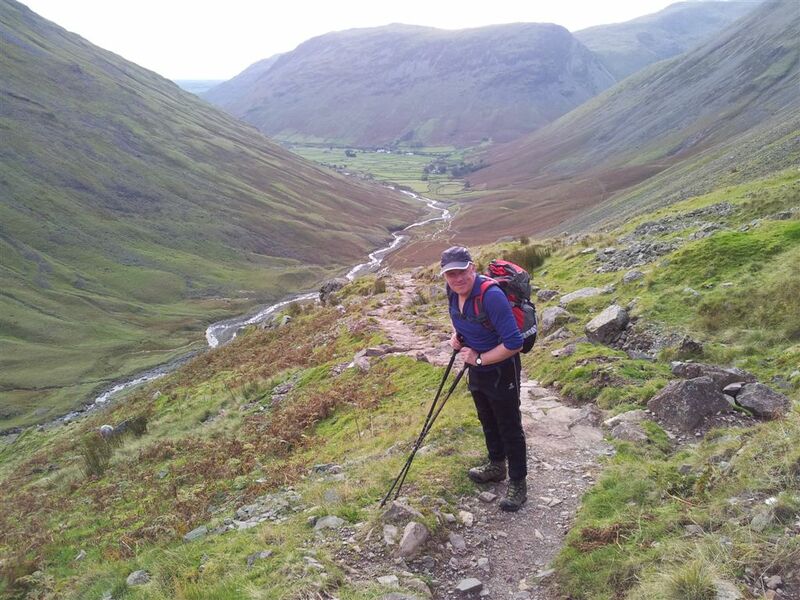 Wasdale Head Inn ahead, I need beer and I need it now! 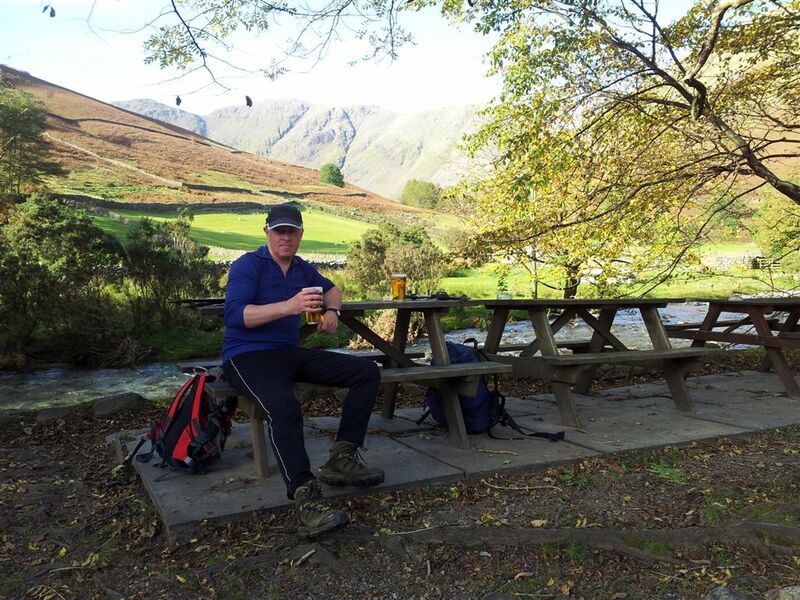 And finally we stepped into Wasdale again and the pub beckoned. Oh and views too! 3.40pm. It had been 12 years and I spoilt the moment by walking into the side phone box thinking this was the pub entrance. No one saw me so think I got away with it. Last time the pub was heaving, this time empty with everyone outdoors. Decent choice of beer, we chose the Loweswater Gold 2012, a good year and a cheeky pint. 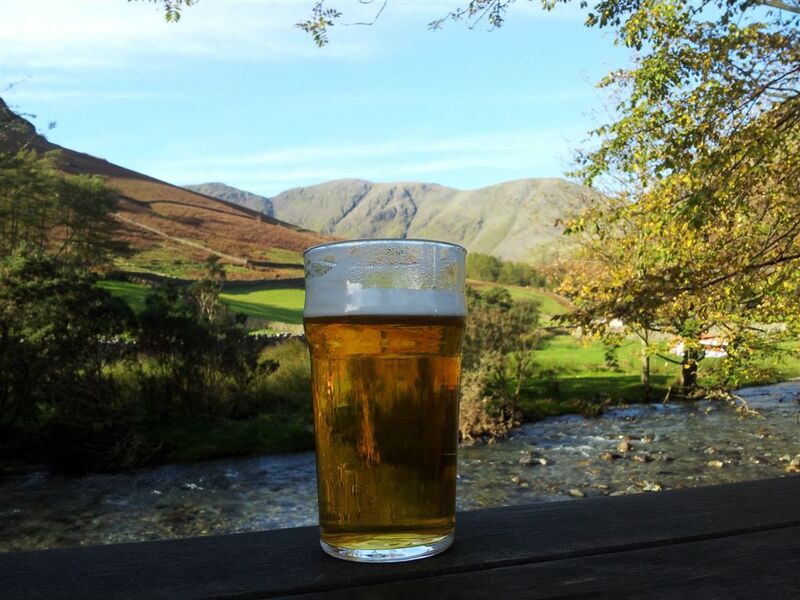 If Cumbrian Ales want to use this pic to endorse their very refreshing tasty Loweswater Gold then my rates are fairly reasonable. Or they could take one themseves. Drat!! 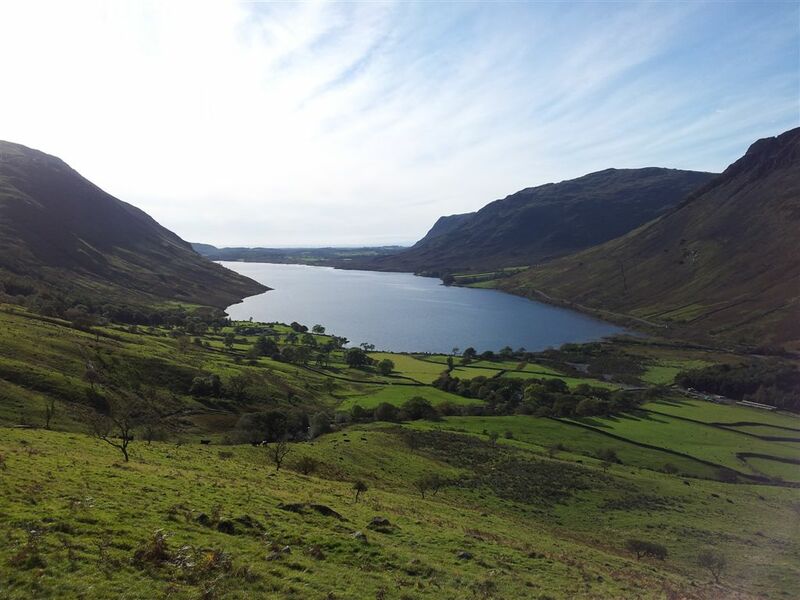 Wasdale Head is a particularly wonderful place, particularly for a pint, with ‘views’ everywhere. 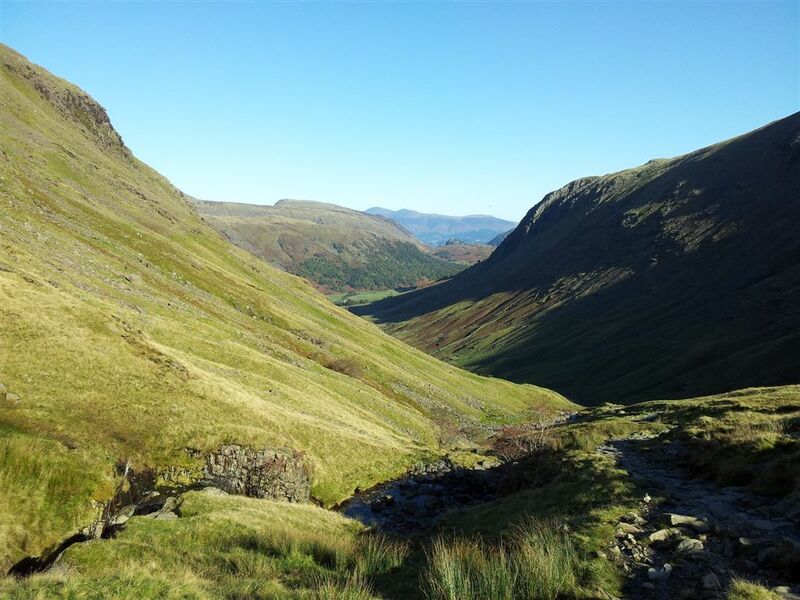 The one’s below were across the cute iccle bridge to Kirk Fell& Gable. We were highly tempted to have more beer but it was 4.15pm & very reluctanly time to start walking. Incidentally last time here was my ridiculous mountain bike ride around Great Gable, Gatesgarth, Black Sail & back down to Wasdale, tiredest I’d ever felt, (blog to follow 1 day). We set off up towards Sty Head, me remembering how hard it’d been pushing a bike up. 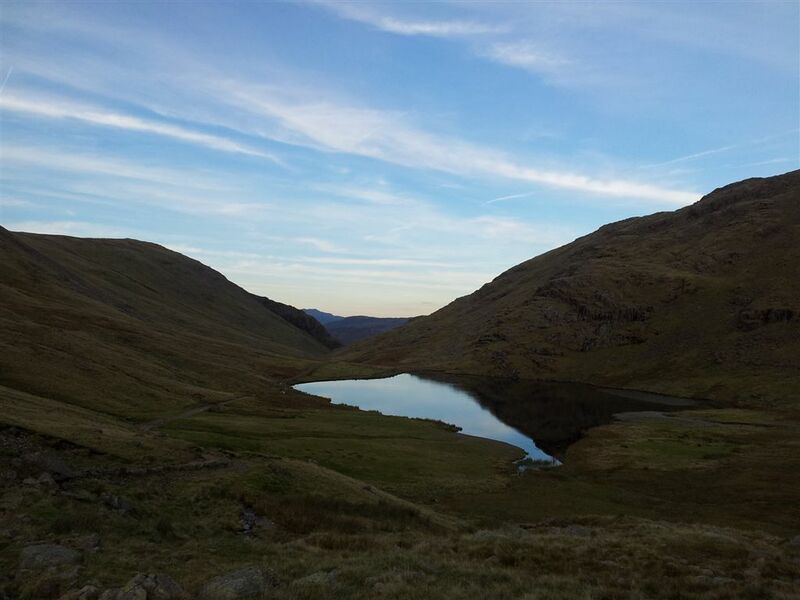 Arriving at a deserted Styhead Tarn at 5.40pm. Only downhill ahead at last now. Bet this hasn’t been photographed before? Well maybe a little. Later over a pint we theorised about next time adding Great Gable on the way back, these things always seem so much easier in the pub over beer. 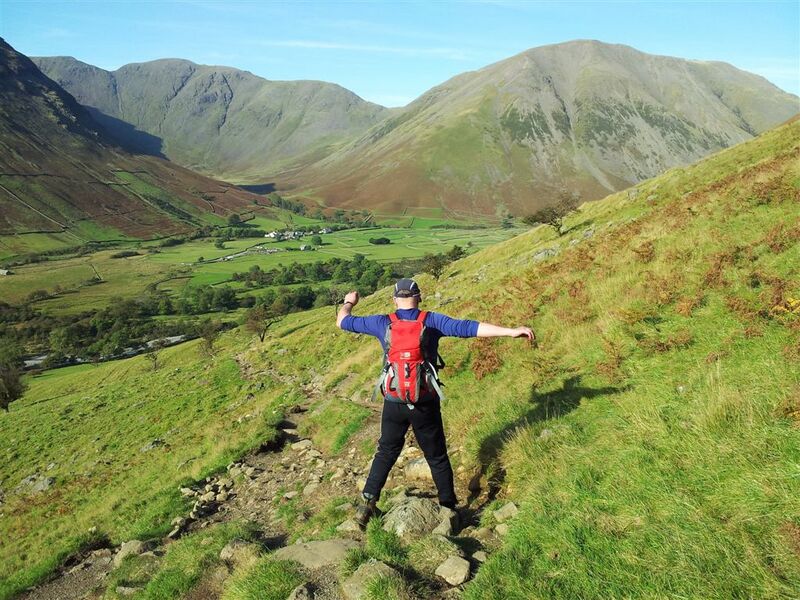 This entry was posted in Lake District and tagged Grains Gill, hiking, Lake District, Loweswater Gold, Mickledore, pint, Scafell Pike, Scafell Pike circuit, Scafell Pike route from Seathwaite, Scafell Pike routes, Scafell Pike via Seathwaite and Wasdale, Seathwaite, Social Hiking, Wasdale, Wasdale Head, Wasdale Head Inn. Bookmark the permalink. Some nice pics. 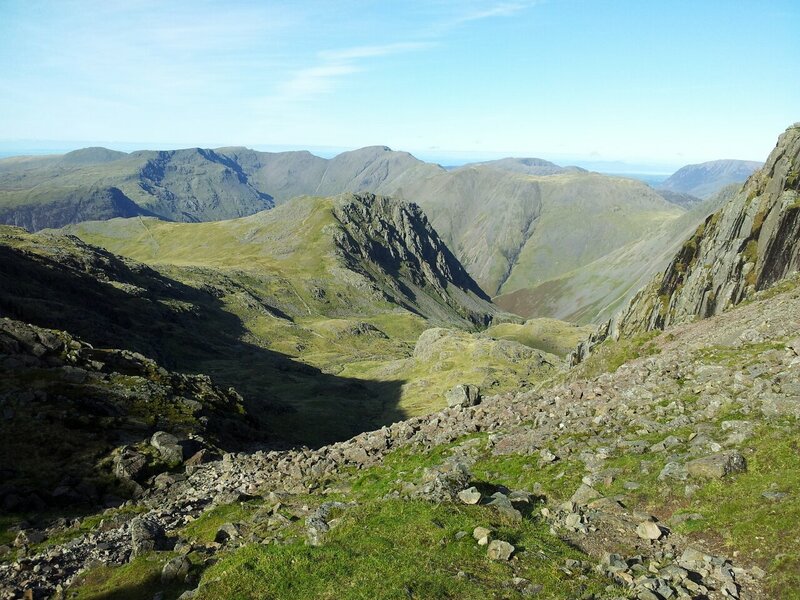 Even I’ve had Scafell Pike totally to myself on very rare occasions! Thanks Stew, unfortunately the 2 times alone up there weren’t suitable for photography, unless you like macro cotton wool. Have you camped up there? Would imagine it’s like a train station sometimes even at night, lots of rock clattering. Excellent echoes in Mickledore, hope you don’t snore. A feast of views Mart. The first shot looking down Grains Gill is magnificent. 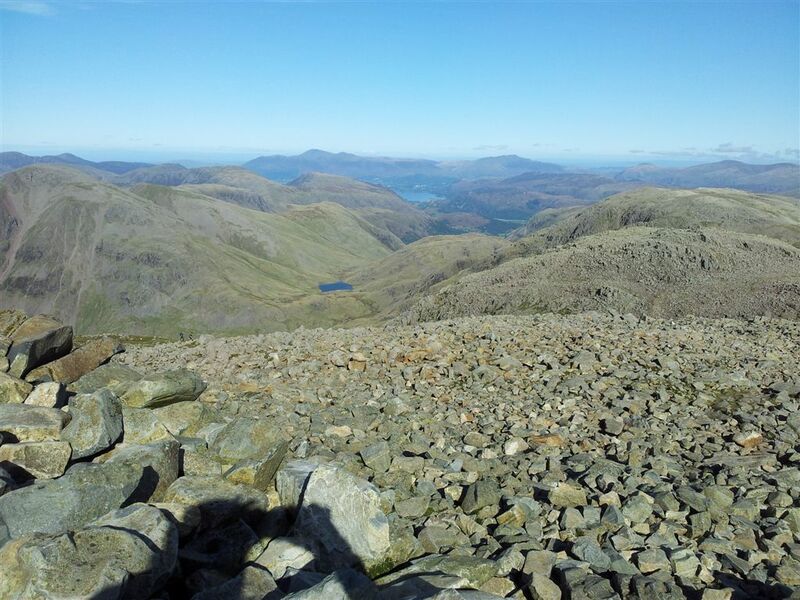 As is the one from the slopes of Scafell Pike. Oh and the ones with you in are good too! Especially the Ministry of Funny Walks one. 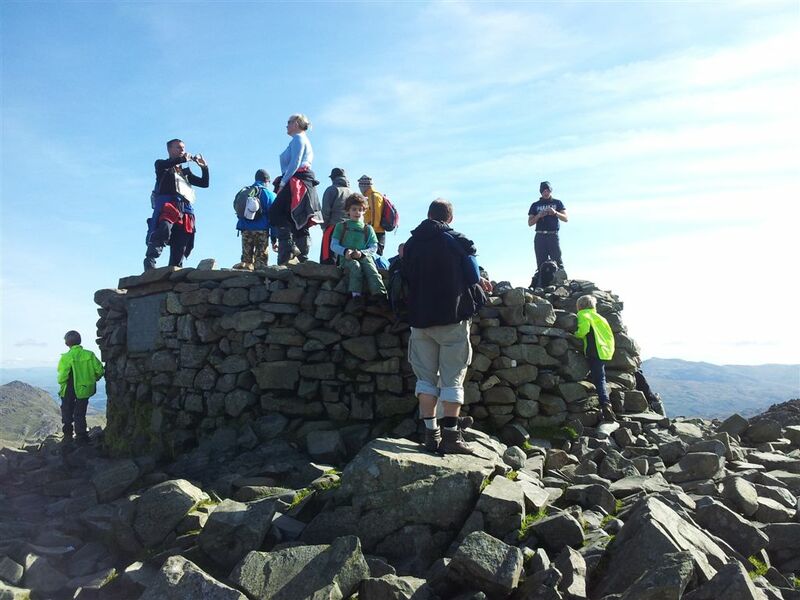 You must tweet this post to Visit-Cumbria and GoLakes. Thanks was just one of those clear days, haven’t had that weather for months, not a bad place to be on a day like that! Thanks Karen. Yeah it’s nice to see people in the pics as it creates scale and also makes the pics more individual. Most places in the Lakes have been photographed many times anyway so it’s good to do something different if poss. I don’t even take my camera anymore these are all phone snaps. Martin, for a man with duff knees this is a big walk with a lot of ascent. Well done. I’m suprised this is your first time up Grains Gill, you know how often I’ve been up it! Cracking shots and the panoramics look very good. That Lowswater gold is perfect. Light but flavoursome, with a hint of citrus. I would sup it all night and I’m not keen on Golds and Blondes. If you ever fancy a walk, give me a shout. Ps and thanks for the panorama tip, the software was on the phone, I just didn’t realise. It’s just press and turn, though more frames make it narrower, 2 or 3 are ideal and a huge step forward for mountain views. Enjoying the blogs, Martin. Keep ’em coming! Thanks Paul, seems like a perfect way of recording a trip, you should try it? Still got some past stuff to do, will be digging out old photos, should be fun! !